I have never canned before, and it is a process I previously found terrifying. It’s like childbirth, everyone has a horror story they must share. You mention you’re thinking about canning and everyone feels the need to share the story about the time their Grandmother blew up the kitchen, or that woman that leveled her house with a chutney explosion. 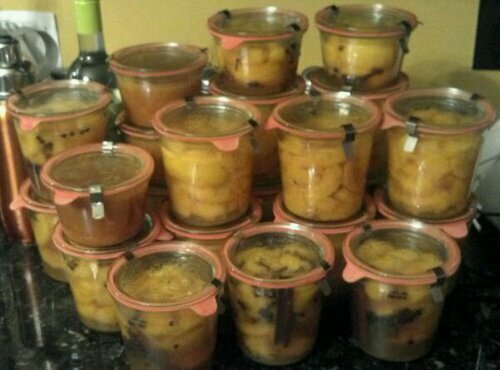 Last year, I avoided canning entirely and made peach brandy, and then froze the rest of my peach crop. This year, my mom bought me a gorgeous set of Weck Jars for Hanukkah, and my freezer is already full, so the pressure was on to figure out canning. I read blogs and asked friends, hinted to my mother-in-law that I might need help, but the peaches were moving past ripe and I still hadn’t worked up the nerve when one of the women on the Midwest Homesteading and Permaculture Facebook group hosted a farm swap. I brought some peaches, and while trading, talking to her about my canning fears. She said the best thing: “It’s like cooking, but with one extra step.” So simple. I can cook. So I just need to cook, and then worry about the canning step. I made three recipes: two from my favorite food blogger, Local Kitchen, with her Honey Spiced Peaches and Maple Bourbon Peach Butter, and the rest of the peaches in simple light syrup from Frugal Living NW. I started the Maple Bourbon and simple syrup, and spent 2 days cooking and canning. Of 25 attempts, only three didn’t seal, which I’m going to call a success for my first time out. Fortunately, one jar each from the recipe batches, so I got to taste both, and they are delicious! I almost can’t wait for winter! I’ll do another canning run this weekend, but to use the weekday peaches, we made a Smitten Kitchen Peach Pie, which was heavenly, and had such an intoxicating smell, I stole a bite before thinking of photographing it. Maybe next time! Hope you’re enjoying your peach harvest too! While on our road trip this Summer, I got to catch up with my childhood friend, Scott Nadelson. He’s an author who writes amazing short stories that you should read, but more important to this blog is this beautiful fence he had built in his backyard. It’s so lovely and perfectly suited for our lot, it has ruined me for big box basic fences from here on out. Another project to add to the Spring/Summer list. Look! 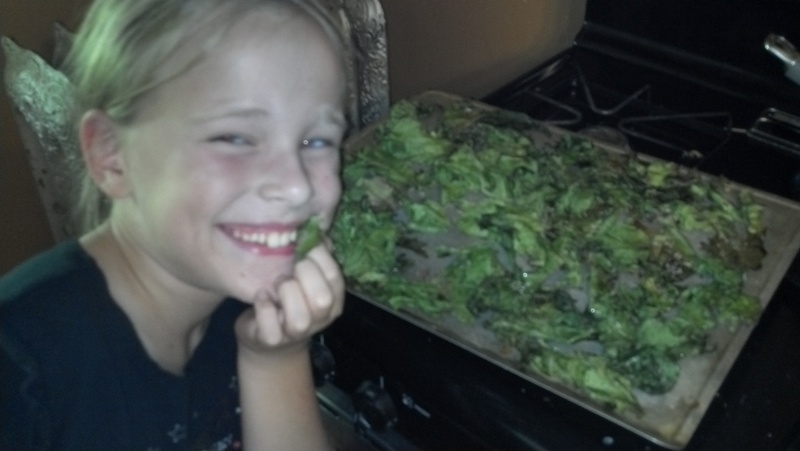 Even the kids like Kale Chips! “What the heck do you make with kale?” I asked one of my girlfriends. The plants looked so pretty at the Downtown Farmer’s Market, but I’m not (yet) a green smoothie girl and I was pretty much at a loss for what to do with all my kale. My garden has largely failed, struggling through our very dry year and suffering from being too shaded by a tree that I’m guessing was not as tall when our garden plats were laid out years ago. But wouldn’t you know it, the one thing I don’t know how to use is going great. I just stared at it for a few weeks, but then it seemed wrong to not reward the kale’s perseverance under such challenging conditions. We had to find a way to eat this stuff. So I asked my friend Rachel, who was so helpful with my peach situation. Rachel gave me a great looking recipe for an African Vegetarian Stew that involved kale. But given the freakish heat in Iowa right now, my ears really perked up when she said “Or you could do kale chips.” Kale, olive oil, salt, bake. This definitely seemed more my speed. (I’m not really a domestic goddess, I just pretend to be one for this blog). 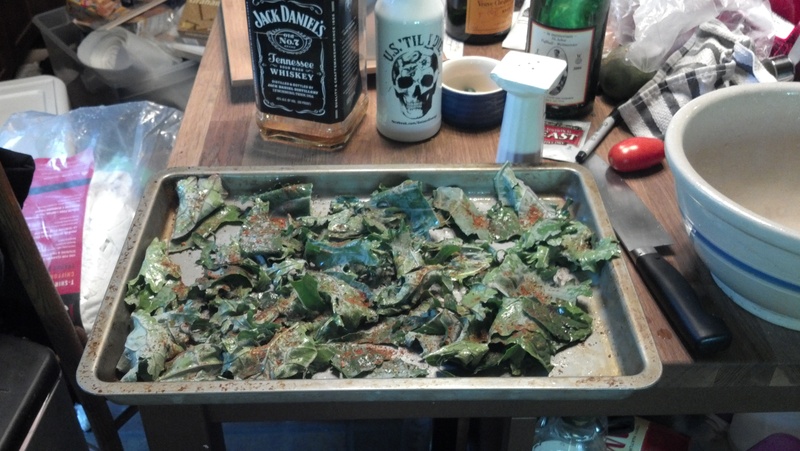 Kale Chips are crazy easy. Hat tip to Shutterbean for the recipe I used, but basically it’s really as simple as tear up kale, toss with olive oil, salt or….get wild with BBQ spice for BBQ kale chips! I used BBQ seasoning from Pampered Chef, and must thank my consultant, Annelie for that brilliant delish idea. Bake as 350 for 10 minutes. Word to the wise, do not wander out to check the chickens….10 minutes is very fast and they will burn! Kale….now a staple in our garden! P.S. There are plenty of blogs with gorgeous photography in pristine kitchens. That is not this blog. That’s my wood stripping box on the left, Jack Daniels and my FC Kaiserslautern wine bottle from when we moved the fridge to it’s new home. My US Soccer Til I Die water bottle…gotta hydrate. And one plum tomato. My photos are a life story, not a museum. Place peaches, lemons and sugar in crock. Dissolve yeast in water (must NOT be to hot). Stir thoroughly. Stir daily for 7 days. Keep crock or vessel covered with cheesecloth.On the 7th day, add the raisins and stir. Let mixture sit UNTOUCHED for 21 days, then bottle. (5 gallon crocks). So my friend Rachel came over and helped process the peaches (we left skins on, because on another website I read it said it would give the brandy a rose color). I got the crock bleached, the ingredients all boiled, chopped, and covered, and it’s going. When I stirred it this morning, it was very fizzy and smelled like alcohol, but I think it was just the yeast. The things I’m unsure of are whether or not cheesecloth is enough to keep bugs out, and if I’m supposed to cover it for the 21 days or not. Then my mother in law stopped by tonight and said if you don’t chop up the raisins, they can swell up and explode. Apparently this happened in another family member’s wine making. So here’s your chance to voice your opinion/advice on our first brandy making venture. Save us from our inexperienced selves as needed! A week of unseasonably warm weather was all the excuse I needed to take a break from the interior work and get in a workout in the garden. We had several raised beds for vegetables, but they were over grown with 4+ years of weeds. We cleared a few beds last year, but we still had half of them to go. The ground is wet and soft this time of year, and the warm weather was the perfect excuse to start prepping. I got through one box before my son and the neighborhood boys he was playing with decided that tearing into weeds was more fun than the swing-set. 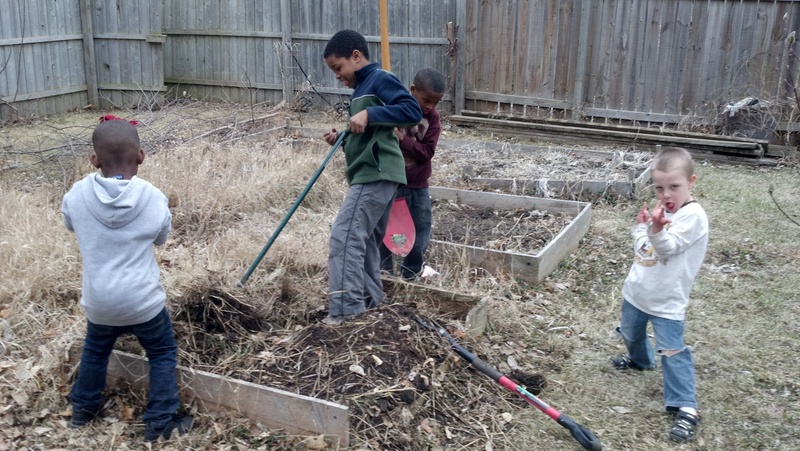 They were so helpful, ripping out weeds and hauling to the compost pile. By the end of the day, we’d ripped out most of the weeds, and alas, destroyed what was left of the rotted wood walls. One step closer to bountiful garden!